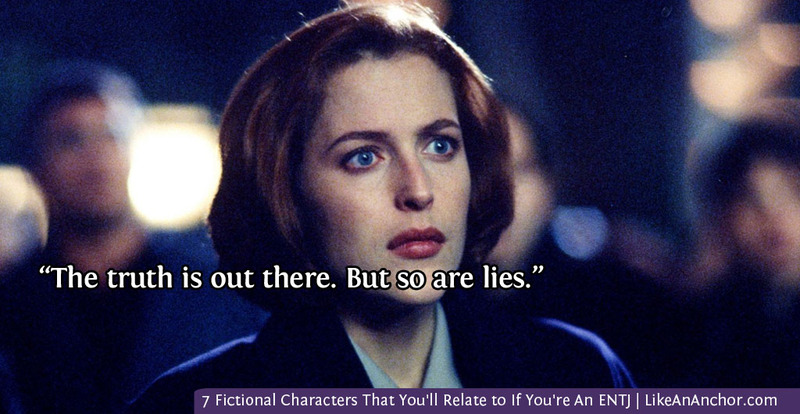 Many real-life ENTJs can relate to Dana Scullys’ desire for logical, objective truths. That’s what ENTJs, as dominant Extroverted Thinkers, prefer to rely on. But their Introverted Intuition is too good at seeing things from other perspectives to completely ignore an intriguing idea even when the evidence for it doesn’t line-up with established theories. This makes Scully a perfect choice to work on the X-Files because she questions everything while also thinking outside the box enough to dig for the truth rather than dismissing Mulder’s theories out-right. 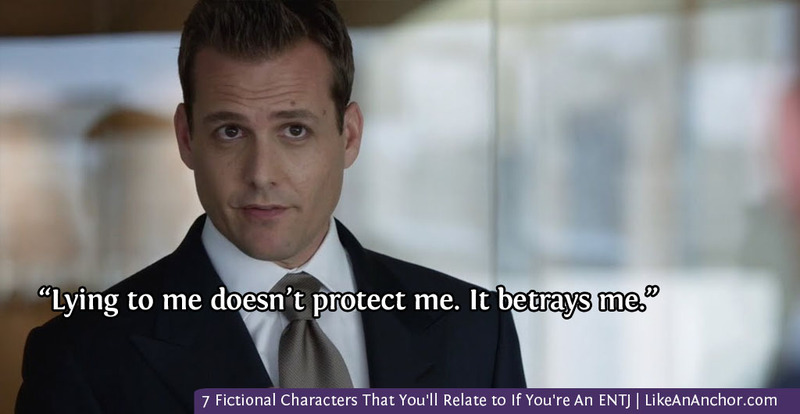 This character is the main reason I watch Suits. He’s embodies many of the stereotypical traits of ENTJs — clever, logical, intense, blunt, and efficient. Thankfully, the show doesn’t leave him that one-sided, though. He also has many other, more nuanced, traits that ENTJs share and those are what makes him an intriguing and, for some, a relatable character. Harvey never crosses his own moral line. He’s absolutely loyal to people who are loyal to him, and is unlikely to forgive when that trust is broken. He cares deeply about certain people, though rarely shows it. He also enjoys sensory experiences that we usually link with SP types (like nice suits, fast cars, sports, and womanizing), which makes sense because ENTJs have tertiary Extroverted Sensing. There are so many NT types in BBC’s Sherlock — INTP Sherlock Holmes, INTJ Mycroft Holmes, the chaotic and hard-to-type Moriarty, and ENTJ Irene Adler. She may be an ENTJ in other versions as well, though (as per usual with fictional characters) these typings are all up for debate. Regardless, she is an incredibly clever Thinking-type woman with characteristics I think ENTJs can relate to. 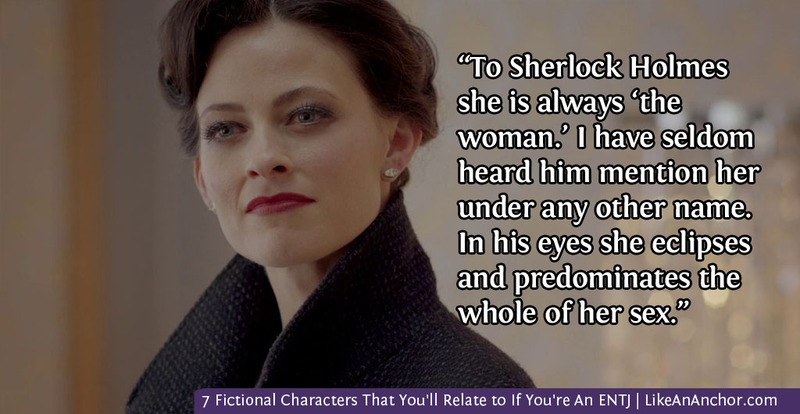 Though I’m sure none of you relate to Irene Adler’s life of crime — and if you can, please don’t tell me 😉 — the way her mind works should be familiar to other ENTJs. Like many other TJ types, Irene speaks her mind, acts with specific goals in mind, likes to be in control, and is typically at least 5 steps ahead of other people in the room. It’s no wonder she’s one of the few people capable of impressing Sherlock Holmes. Captain Picard from Star Trek: The Next Generation is perhaps more of an INTJ than an ENTJ, but that’s no reason both types can’t see him as a relatable character. Not only is Picard a good example of an NTJ type, but he’s also a mature, well-rounded version of his type. He’s a bit more laid-back than many other fictional ENTJs and is also more comfortable with his Intuitive, Sensing, and even Feeling functions and some of the less mature ENTJs on this list. ENTJs often have strong leadership skills, and mature versions of this type can learn to utilize their Thinking strengths alongside the flexibility and empathy needed to work with people in a way that earns their trust and respect. One way that ENTJs can do this is by growing their co-pilot Introverted Intuition and using it to see things from various perspectives rather than adopting a hard-line stance on every issue. 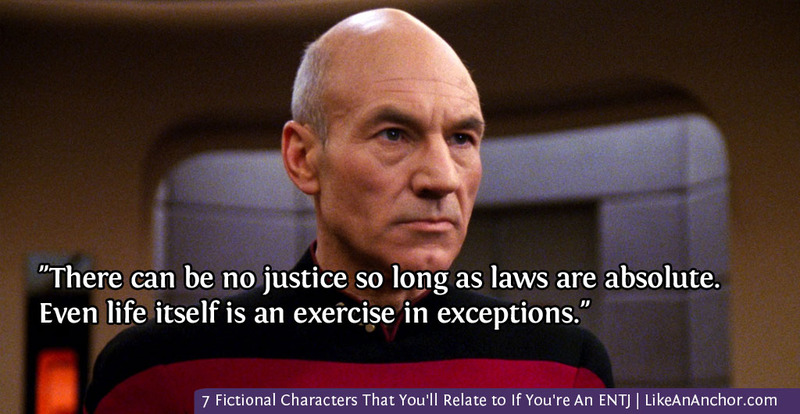 One example from Picard is found in the quote I’m featuring for his character. He believes very strongly in morality and justice, but he does not condone blind application of those laws. He has a more nuanced perspective, which I think many NTJ types can relate to. Perhaps two Star Trek characters in one post is excessive, but what can I say? I’m a fan. And they’re good characters. Apparently ENTJs make excellent ship’s captains. Also, when looked at together, Janeway and Picard demonstrate how very different two people can be even if they’re using all the same psychological functions in their stack. For example, both Janeway and Picard prefer to make decisions based on logical, impersonal criteria and they’re assertive about their moral stances. However, Janeway tends to have a shorter fuse than Picard and makes more hasty decisions. Like Picard, Janeway also uses her intuitive perspective and pattern-recognition abilities to great advantage. She’s a scientist as well as a leader and, while she knows when to rely on the talented people serving with her, she’s also quite capable of coming up with her own innovative solution out of a sticky situation. 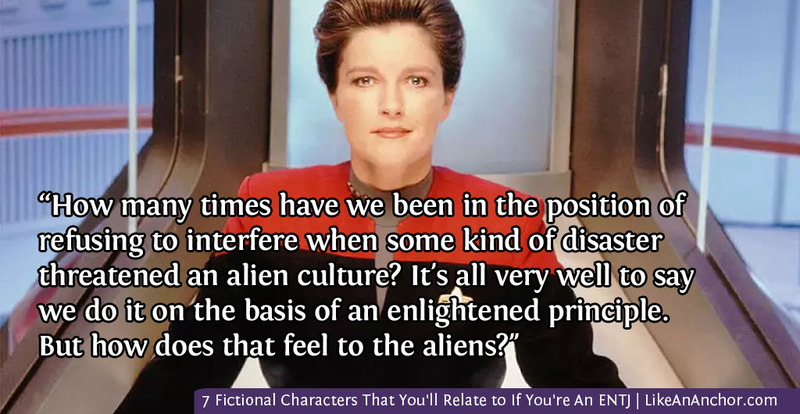 In addition, I’m sure many real-life ENTJ women can appreciate and relate to the fact that the Star Trek: Voyager writers made Janeway a strong, confident, and capable leader without turning her into a feminine stereotype. 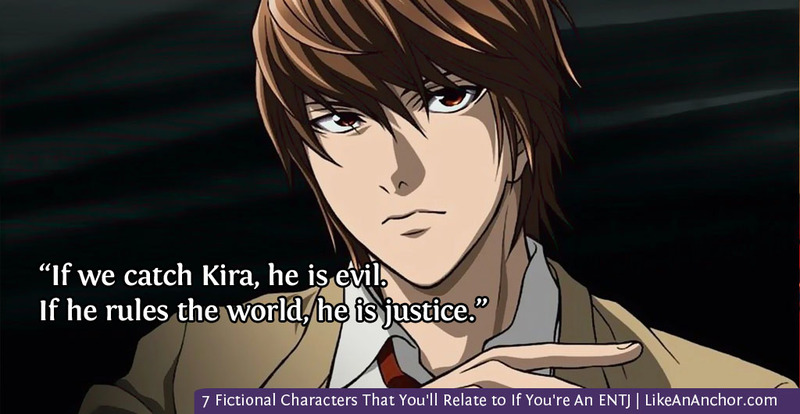 I have not actually seen or read Death Note, but Light was mentioned by several ENTJs on message boards and Reddit threads where they talked about which characters they felt were also ENTJs. For an excellent article on why Light can be typed as an ENTJ, click here. Light is a natural genius who’s highly perceptive, good with problem solving, and skilled at mapping out scenarios. Popular with his peers and praised by adults, he also develops quite a high level of hubris that plays-in to his decision to become a “god” once he has the power to kill simply by writing a name in the Death Note. Thankfully, most ENTJs can’t directly relate to Light’s cold, ruthless nature that develops as he becomes a villain. Many can, however, relate to the systematic way he pursues goals and his ability to persuade other people that his cause is just. Quote from of Death Note Season 1, episode 30 (2007). Image: Light Yagami animated by Madhouse. As a dominant Extroverted Thinking type, Maximus is logical and decisive. Also, like many other ENTJs on this list, he uses his co-pilot Introverted Intuition to create long-view plans, strategize, and get inside his enemies’ minds. With this character, we also get to see his inferior process of Introverted Feeling as he struggles to handle his grief without sharing any of his emotions with other people. 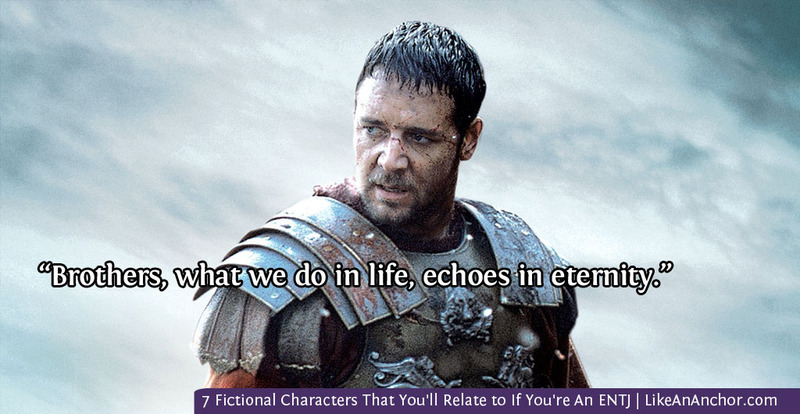 Like many real-life ENTJs, Maximus feels things deeply and his values and emotions play a large role in his choices, though he makes sure they’re not readily apparent. What did you think of this list? 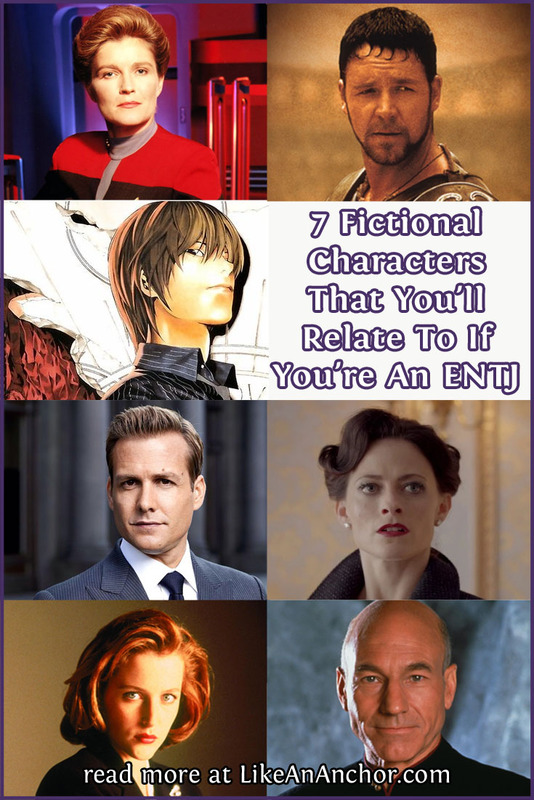 If you’re an ENTJ, which fictional characters do you relate to best? Is there anyone you’d add to or take off of this list? I’d love to hear your thoughts! ← Are We Making The Most Of God’s Gifts?